Every year, in thousands of new hamshacks, this scene ensues. The Novice sends away to all the QSL printers that advertise in 73, QST, the Callbook and Popular Electronics. Then, amid samples of stock, print styles, cartoons, illustrations and doo-dads, the new ham "sends away" for the card that expresses his personality ,.,96 point callsign, as in the WA6XXX card, superimposed on the schematic-diagram background, as in the WA5XXX card, with overside fill-in data as in the ZD 10AA card. 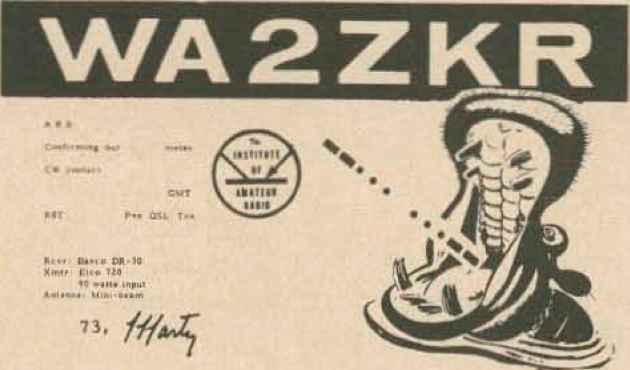 The January '62 issue of 73 had a good article on making QSL#s for club members. The idea was that all the members could chip in to pay for an artist's design which would then go on all ol their cards, this approach is fine if you don't mind carbon copy cards and belong to a club. If not, it's not. Many DX QSO's take less than a minute; the really rare ones run about 20 seconds. Your personality is your QSL. And when you're angling for a rare card or overseas friendships you won't cut ice with a carbon copy card. An original, imaginative card will stay on his wall and get you his card in reply. In general, homebrew cards cost less than store-bought ones, too. ■r in an office with an IBM Executive or other plush electric, ask her to peck out a few words for you on lunch break. Try for the smallest, plainest type you can get. But you type out your name, exact QTH and all fill-in data exactly as you want it to appear on the card first. Use a ruler to mark off on the oak tag or white cardboard the exact dimensions oi a postcard. Then draw in very light blue (which won't reproduce) or VERY light black (erase before printing) pencil a border about Ja inch inside the postcard dimensions. Your working area is inside the border, Type on paper your fill-in data, name and QTH. Look around in magazines for a small cartoon illustration that would be amusing and to the point of a QSL. Cut out the fill-in data and the cartoon. Now the callsign . . . you can stencil it in heavy-black pencil or india ink, you can cut it outletter by letter (all same size and style) from magazine type, or for a little money your printer will set it in your chosen size and style. Position the cut-outs on the oak tag as you want them to appear. Make sure spacing is even and everything is level When you're ready, paste each item to the oak tag. To decide how many postcards to buy, remember that the printer has to take time and expense in preparing the negative, plate and press, I he more cards you make the smaller your printing cost per card. However, if you re a Novice you may prefer to print comparatively few. If I were a Novice on CW I'd print about 200 cards. An active General on (he DX bands might go 500 or more. Make sure you've included everything . . . name, QTH, other station's callsign, band, date & time, RST, Pse QSL Tnx, Rcvr, Xmtr, Ant, IoAR„ AJRRL, etc., then cart paste ups and postcards down to the printer. !rill-in data, il you type your own, will vary with the operator. If you 11 keep your rig as long as you expect the cards to hold out, type it in; it'll save writing, ]f you're a contester or DXer be sure to duplicate fill ins for band and mode so you can verify "two-way SSB" QSOs, Reports of C\V men should use RST, SSB men use QSA, and AM ers just RS, If you're multi-mode, use Report. Women can use PRETTY PSE QSL TNX, crossing out what doesn't apply. Religious hams can close with "73 & 76 (God bless you). You can also print in T3 76 8b and check the appropriate one. The card may be decked out in a variety of ways. I clipped an IoAR insignia from an issue of 73, You II find the ARRL emblem in QST, your college insignia in the catalog, your state insignia from a Chamber of Commerce, Other symbols can be tvped in as a group: RACES, AREC, RCC, DXCC, ROWH, OOTC or what have you. There are a few cautions. If you try printing negative, with while letters on black back-groiuid, do it only with your callsign. If you try printing typewriter-sized letters negative the large amount of ink will block up, forming poorly shaped letters. Td say minimum type size for negative work is about 24 point (il inch high). Stay away from newspapers for copy, type or even cartoons. Reproduction quality is marginal and the paper tears easily while you're working on it. Rut il you really want a newspaper cartoon, use it. There are no other hidden obstacles.